The fifth expedition to East Galicia of the Association was composed of university and yeshiva students from Israel and Russia, including students from the “Siach Yitzchak” Hesder Yeshiva, Hebrew University students and students of Jewish Studies from the St. Petersburg and Moscow State Universities. It was guided by Drs. Boris Khaimovich and Ilia Lurie of the Hebrew University and Mrs. Marina Brook of St. Petersburg University. 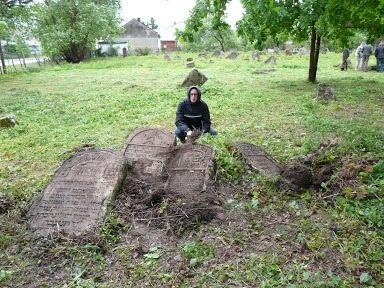 The destination of this expedition was two towns in which large Jewish cemeteries have survived: Bolekhiv (Bolechów) and Pechenizhyn (Peczenizyn). 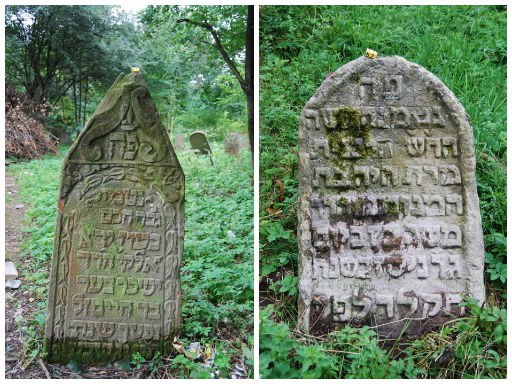 The only witness to the former Jewish life of this town is an old cemetery, situated on the hill across the river from Pechenizhyn. 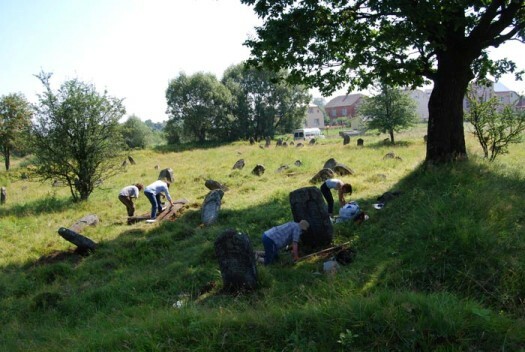 Decades of neglect led to large parts of the cemetery being grown over by plants and trees; therefore cleaning and preparation work was undertaken before the arrival of the expedition. This enabled the approach of expedition members to the entire cemetery and the documentation of all of the surviving tombstones. 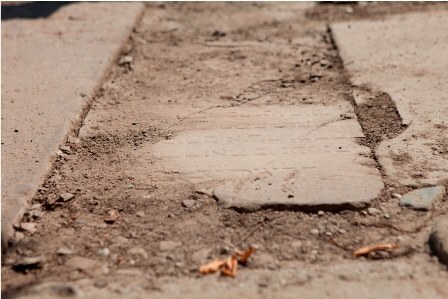 All in all, 700 tombstones, dating from the mid-18th century until 1939, were documented. Many of these had sunk into the ground, and expedition members were often forced to dig them out and remove layers of greenery, ash and weeds in order to document them. Some had fallen over and broken over the years and needed to be turned over in order to reveal the decorated side of the tombstone. As a result of the work undertaken in the Pechenizhyn cemetery, we have established that it is the largest and best preserved of the Jewish cemeteries in Pokutie (the Kolomyja region). It enables a rare view into the unique social and artistic life of the Jews of the region, from the 18th century until the Holocaust. 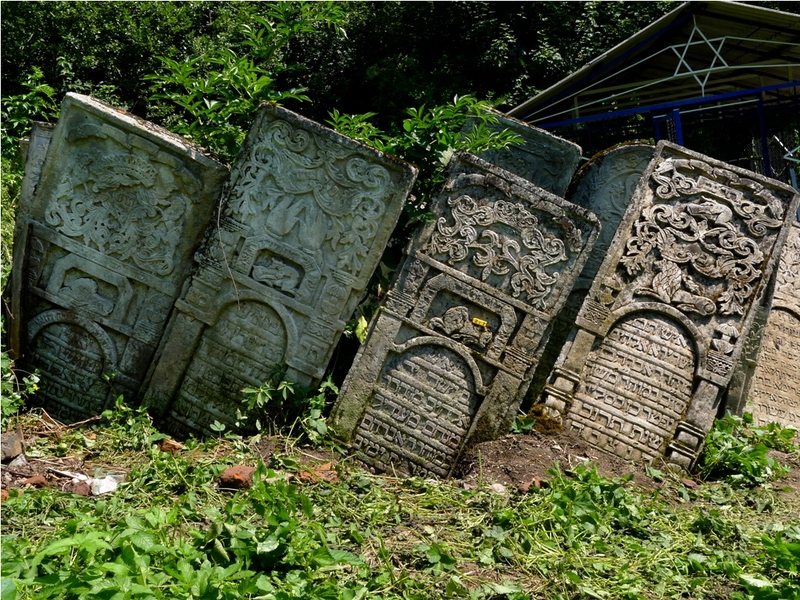 Different artistic trends, representative of the Jews of Galicia in different periods, are well expressed in the tombstones documented by the expedition. Bolekhiv, to which the expedition turned after completing its work in Pechenizhyn, is a representative of a completely different type of Jewish settlement. Bolekhiv was a relatively large city, established at the beginning of the 17th century, which served as an important center of social and economic life in the Dolina region. Jews inhabited the city from its inception, and during the second half of the 19th century comprised about 75% of its population (3,323 out of 4,237 inhabitants in 1890). Among the Jewish inhabitants of Bolekhiv were those involved in major trade and industry (particularly tanning), scholars and famous rabbis. Jews played an extremely important role in the city’s economic and public life, and in 1874 Israel Hauptman, the Jewish owner of the city’s tanning factory, was elected mayor. One of the most notable figures in Bolechów’s Jewish community was the wine trader and public figure Dov Ber Birkenthal (1723-1805), the author of a memoir which serves as an important source of data regarding Jewish life in the Polish-Lithuanian kingdom during its final years. The Jewish Enlightenment and processes of modernization reached Bolechów in the 19th century, finding expression in the activities of a local chapter of the Enlightenment movement, which managed to take over communal leadership, and in the establishment of the progressive Jewish school in the city in the 1850s. Alongside these developments, the majority of the Jewish population of Bolekhiv continued its traditional lifestyle and was even influenced by the spread of Hasidism. In the city center, near the marketplace, where Jewish life was centered, a large fortress-like synagogue was built at the beginning of the 19th century; near it operated several halls of study and Hasidic kloizes. 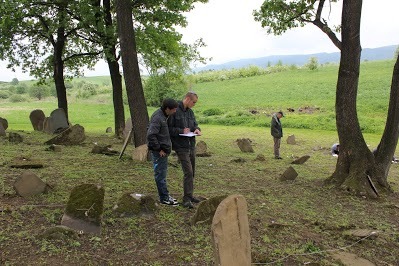 The purpose of the expedition in Bolekhiv was the full documentation of the tombstones in the cemetery and the identification and documentation of locations connected to the Jewish life of the city. Already on the first day of work in Bolechów, it became evident that the cemetery was a large one, much more so than implied by the descriptions of previous scholars (expedition members estimated that around 1,500 tombstones remained). 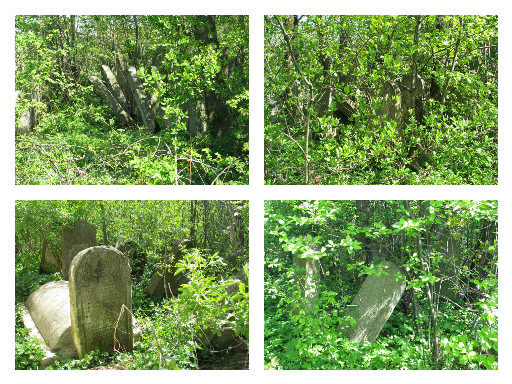 Many tombstones were sunk in the ground and covered by ash and weeds, some were overturned. The members of the expedition took great pains to uncover and document these. Among the tombstones documented were those of Dov Ber Birkenthal and his family, those of various famous rabbis and scholars, that of Israel Hauptman and others. Many of the tombstones testify to the high cultural and artistic level the community maintained from the end of the 17th century and through the beginning of the 20th. They comprise an unparalleled artistic collection, no less important than collections from Jewish cemeteries in central Europe, both in quantity and in quality. The expedition documented about half of the tombstones (about 750) in the cemetery and plans to return next year to document the rest. As mentioned above, the city was also surveyed in order to identify significant sites relating to the city’s Jewish past. 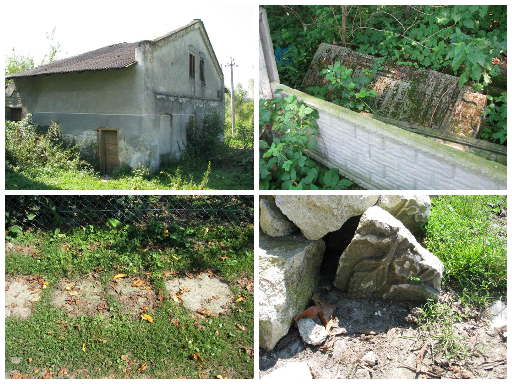 Based on testimonies of Bolekhiv descendants and veteran locals, a number of buildings formerly owned by Jews or housing Jewish institutions were located and documented. All of the findings of the expedition, including descriptions and pictures, have been uploaded to the website. As part of its ongoing projects, Jewish Galicia and Bukovina Association sent a group of students from ACE High School in Israel (www.aceisrael.com) on a heritage trip to Western Galicia, Poland. The trip was coordinated and run by Nesivos Yeshiva Tours. A total of eight students and two staff spent just over a week in Poland, three days of which were dedicated entirely to the cemetery renovation and documentation in the village of Nowy Zmigrod. Nowy Żmigród, until 1946 called Żmigród, is a village in Jasło County and sits at the south-eastern corner of Poland. The population of Żmigród over the last few centuries has fluctuated from 1,500 to 3,000 people. At times Jews constituted 60% of Zmigord’s inhabitants. The first information about Jews in Żmigród dates to 1410 when Jews were permitted to settle throughout the city. A large two-storey synagogue was built there in the 16th century. The Jewish community of Żmigród had under its jurisdiction other Jewish Kehillas including Jasło and Gorlice. The latter communities had to bring their dead for burial in the Żmigród cemetery. In 1765 the total Jewish population of the city and the neighboring areas consisted of 1,926 people. A great exodus took place during World War I, when many of the Jews of Żmigród left for overseas .Most Jews in Żmigród were Hasidic, largely following the Sanzer Rebbe. After Żmigród lost its city status in 1919, the Jewish population dropped to 800 people by 1939. Early in 1942, a ghetto was established in Nowy Żmigród. More Jews were forced to move into the community from nearby villages. The Jewish population reached 2,000 people with an unbelievable level of overcrowding. On July 7, 1942, all the Jews were ordered to assemble in the square whereupon they were surrounded by the German and auxiliary police units. Women, children, sick and elderly people were separated from the able-bodied. After hours of waiting, 1,250 Jews were led to the forest of Halbow where they were killed into prepared execution pits. Some of the survivors of the round-up were sent on August 15, 1942 to the Zaslaw labor camp near Kraków. Another group of survivors were sent to the Płaszów death camp. The last remnants of the Jewish population were then sent to the Belzec death camp at the end of the summer in 1942. The ACE High School group was warmly greeted in Nowy Zmigrod by Rabbi Natan Dudek Levin from the Rabbinic Commission for Cemeteries in Poland and by administration and senior class of the local high school who showed a presentation that they had created about the history of Jews in Nowy Zmigrod. In addition, the Director of Culture for the region spoke to the group and accompanied it for much of its work. A local internet TV videographer as well as a news-crew filmed the group's work and interviewed its members. 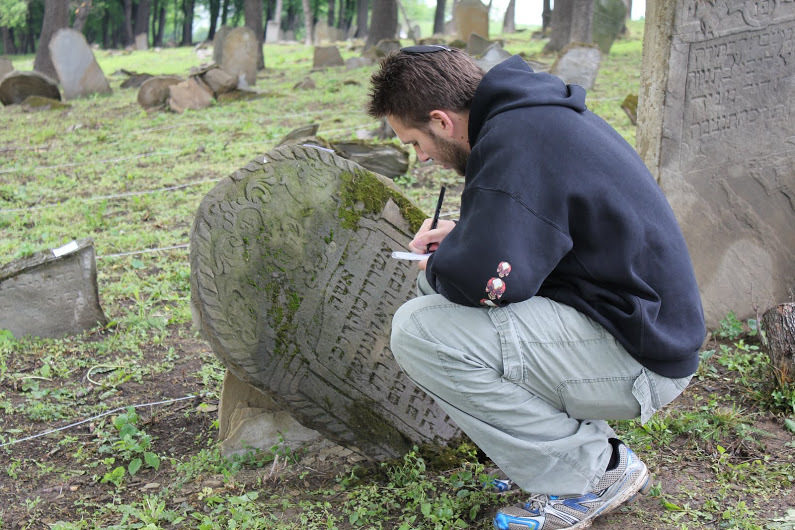 Despite inclement weather, the team documented over three hundred graves stones, mapped out the cemetery, and did general maintenance and cleaning of the cemetery. All of the students found this project to be invigorating education and emotionally and are looking forward to being part of such ventures again in the future. On July 22nd 2012 a fourth delegation to Galicia, run by the Jewish Galicia Association, commenced. This time the destination was the region of Pokuttya, between the Prut and Cheremosh rivers in southern Galicia. This area was, for hundreds of years, an important intersection between Poland and Romanic and Moldovic lands, and developed a diverse and unique local culture. At the beginning of the 16th century a Jewish community developed and grew in Kolomiya, Pokuttya’s capital, and its surroundings. Additional Jewish communities later developed in other towns in the region and existed there until the Holocaust. The purpose of the Association’s delegation was the documentation of traces of Pokuttya’s Jewish communities, which developed a distinct and unique culture which was later integrated into the general social, cultural and economic life of the entire region. The delegation was composed of university and yeshiva students from Israel and Russia, including students from the “Siach Yitzchak” Hesder yeshiva, Hebrew University students, Bar Ilan University students, as well as students of Jewish Studies from the St. Petersburg and Moscow state universities. It was guided by Drs. Boris Khaimovich and Ilia Lurie of the Hebrew University, Mrs. Marina Brook of St. Petersburg University and Mrs. Alla Sokolova, a researcher from the St. Petersburg Museum for the History of Religion. An additional member of the delegation leadership was the Israeli documentary cinematographer Mr. Bernard Dichek. The work of the delegation was carried out in two groups. 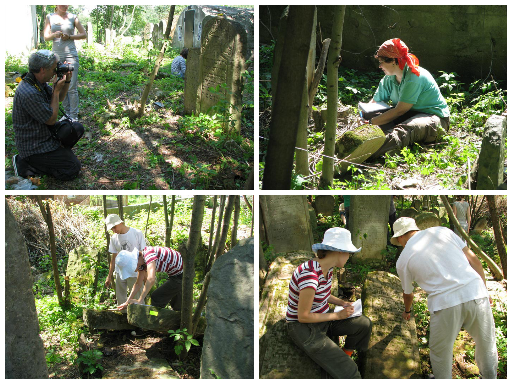 One group undertook work in the Jewish cemeteries of Yabluniv and Kosiv, and the second worked in Kolomiya. Kolomiya (Kołomyja). the most developed city in Pokuttya at the time, boasted a large Jewish community – on the eve of the Second World War its numbers reached 18,930 (out of a general population of 42,676). This community was culturally vibrant and complex, and its influence on the Jewish culture of Galicia was significant. Before the Holocaust there were approximately 50 operational synagogues in Kolomia, among them the magnificent “Die Hoiche Shul,” a Yerushalaim synagogue, diverse Hassidic kloizes and a Zionist synagogue. One of the central orthodox rabbinic figures of Europe, Rabbi Hillel Lichtenstein, presided as the Rabbi of the city for 23 years (1815-1895). Rabbi Lichtenstein was particularly active in the battle waged between the progressive and orthodox factions over the shaping of modern Judaism during the second half of the 19th century. Jewish political and cultural organizations which developed toward the end of the 19th century enriched communal life, and the city was home to a variety of educational institutions, reflecting a wide array of ideological stances. Between the two World Wars a public library, named after Itzhok Leibush Peretz, operated in the city. Kolomiya’s Jews had an important role in the economic development of the region. There were many Jewish businesses in the city: flour mills, beer breweries, banks, tanneries, weaving and prayer shawls factories and brick-making factories, oil refineries and more. Jewish printers published books and other materials, not only for Jews but also for their Christian neighbors – Polish or Ukranian. Beginning in the second half of the 19th centuries, Jews took an active part in the communal and political life of the city. Kolomiyan Jews were chosen as representatives for the Galician Sejm and the Vienna Parliament. Jews had respectable representation in municipal government and Jewish representatives were even appointed to mayoral and vice-mayoral positions. During the Holocaust all of the Jews of Kolomiya and its environs were concentrated in a ghetto comprised of three separate sections. During 1942 these sections were burned and the entire population of the ghetto was destroyed: some were murdered in the city streets, others were taken to the Belzec extermination camp, and the rest were shot in the forest adjoining the village of Sheparivtsy, near the city. Nowadays there are several dozen Jews living in Kolomiya – the descendants of the families who settled in the city after its liberation by the Soviet army. The purpose of the group working at Kolomiya was the identification and documentation of locations connected to Jewish life in the city. All of the synagogues but five were destroyed during the Holocaust or the period of Soviet rule, and of the three Jewish cemeteries in the city, only empty lots remain. However, the delegation managed to locate buildings which formerly housed different Jewish public institutions: a hospital, an old age home, the Jewish council, a school, a girl’s gymnasium and more. During a tour of the city, members of the delegation also met locals who gave interesting testimonies about the lives of Kolomiya’s Jews. The majority of the group’s findings were presented during a guided tour of the city for the entire delegation. The adjacent towns of Kosiv (Kosów) and Yabluniv (Jabłonów ) present a different aspect of Jewish culture in Pokkutya. These were small settlements, in which Jews constituted a large majority of the population. Jewish presence in Kosiv is first mentioned in 1635. The town later became famous among Galicia’s Jews as an important Hassidic center: Hassidism took root in the town from its very inception as a movement. Various traditions tie the city to the Ba’al Shem Tov, the founder of the Hassidic movement. From the end of the 18th century until the Second World War the town was home to an important and influential Hassidic dynasty (of the Hager house). 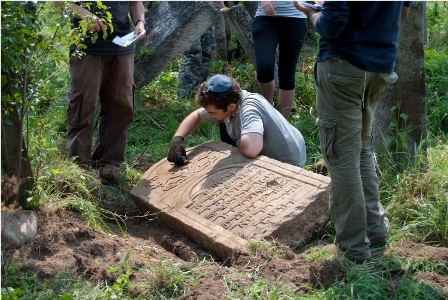 The Jewish cemeteries of Kosiv and Yabluniv survived the War: the oldest tombstones located by the delegation have been dated to the beginning of the 18th century. 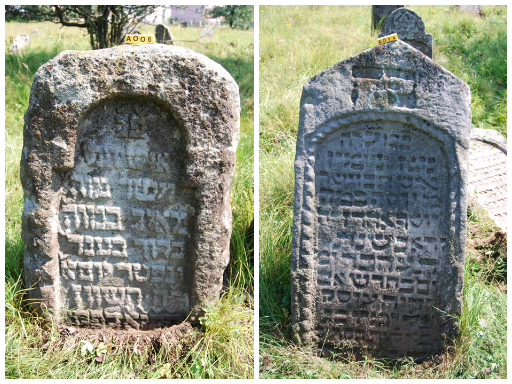 The Jewish tombstones of these towns are unique witnesses to a particularly rich artistic culture that developed in the region in the 18th and 19th centuries. 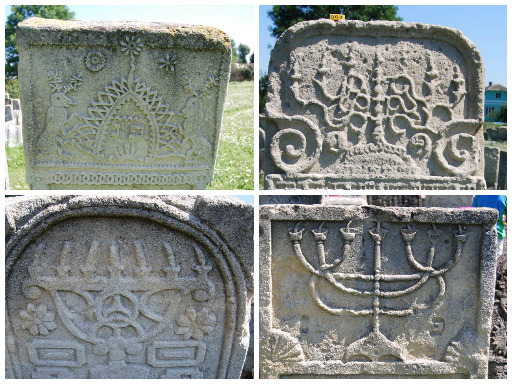 Stone engravings exemplify a complex symbolic language of images utilized by their creators – the anonymous artists of Jewish Galicia. The walls of a wood synagogue in Yabluniv, which unfortunately did not survive the war, were also decorated in this symbolic language. 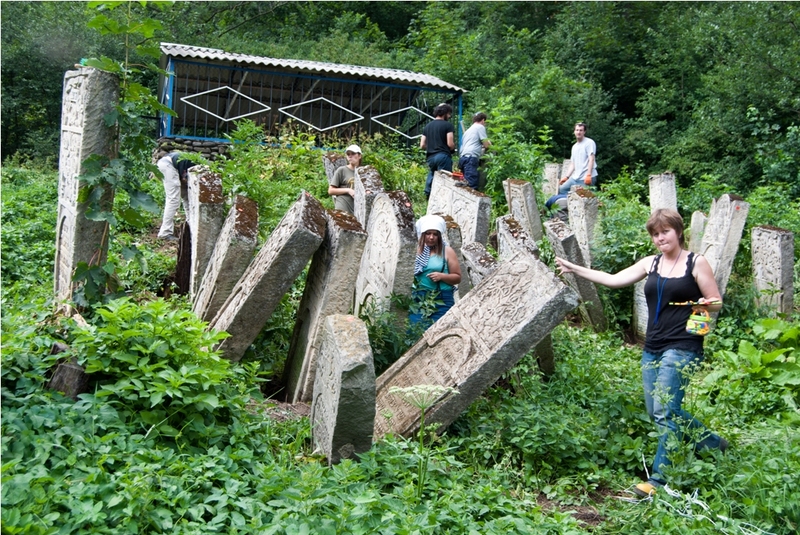 The group that worked in Yabluniv and Kosiv documented around 600 tombstones, including all of those from the Yabluniv cemetery and a large portion (around 300) of those from the Kosiv one, which is situated on a steep incline and therefore particularly difficult to access. Over the course of the delegation a large quantity of material was collected, and this material has been processed and is presented on the Association’s website, thus making an important contribution to the research and commemoration of the historical and cultural legacy of Galicia’s Jews. The field schools are one of the main activities of our organization. Every summer from 2009 a group of students from Israel documented old Jewish cemeteries and buildings in 14 diffrent cities in Galicia with over then 10,000 tombstones.